Turkey is a great place to visit as there is so much to see and do. There is an enormous amount of history, some of which you see in museums but most of which you encounter out in the open air in cities and the countryside. The oldest known urban settlement in the world was found in southwestern Turkey, and renowned ancient cultures including the Hittite Empire and Troy were found here. There are also lots of opportunities to do things outdoors, from mountain trekking to exploring the ancient sites in Cappadocia. Modern-day Turkey was the home of a long series of civilizations before the Turks arrived from Central Asia around 1100 AD. Çatal Hüyük, near Konya, is the oldest urban settlement ever discovered. It was an urban settlement from about 7500 BC to 5700 BC, and it is the largest and best-preserved Neolithic site that has been found. Its population is estimated to have been around 5,000 to 7,000 on average, with a peak of about 10,000 people. Anatolia has been home to later and better-understood people including the Hittites, the Hurrians, the Urartians, the Lycians, the Cimmerians, and others. Hatuşaş was the capital of the Hittite Empire, which flourished roughly 2000-1250 BC. Troy (and thus the Trojan War) was on the northwestern coast along a narrow and strategic strait connecting the Black Sea to the Mediterranean. It was founded around 3,000 BC, while the war described by Homer happened approximately 1250 BC. Two of the Seven Wonders of the Ancient World are in Turkey — the Temple of Artemis in Ephesus, and the Tomb of Mausalus in Halicarnassus (now Bodrum). Plus a third, the Colossus of Rhodes, is just across from Marmaris. The setting of much of the Anabasis, a.k.a. The Persian Expedition, by Xenophon, is in eastern and central Turkey. King Midas and King Croesus lived here, both of them ancient rulers famous for their wealth. Alexander the Great began his Asian campaigns here, starting near what even then was the ancient site of Troy. Turkey is also the place where Julius Caesar said, "Veni, vidi, vici", and where Anthony and Cleopatra had their hideaway. That gets us about to the year 1 AD. Then there was Ephesus and Antioch, the number two and three cities of the Roman Empire. Over half of the New Testament was either written to communities in Turkey, or was written while the authors were there. Today's Turkey was the home of the Byzantine Empire. Rome fell, or maybe just faded away. Under great leaders like Constantine and Justinian the Eastern Empire was what mattered. After many centuries of an empire ruled from Constantinople, the Turks showed up. Suleiman the Magnificent lived up to his title, and the Ottoman Empire became one of the largest empires the world has ever seen. It included much of eastern Europe, parts of Ukraine and Russia, the Caucasus, all of the really habitable parts of Arabia, east through Baghdad into Persia, all of Egypt and beyond up the Nile, and all of the North African coast. The mystic poet Mevlana Rumi founded the Whirling Dervishes, a Sufi sect. There are plenty of fun, and sometimes just downright strange, things to do in Turkey. Cappadocia has bizarre natural formations carved into homes and churches over the past few millennia, with entire underground cities. You can explore during the day and stay in a nice guesthouse with cave rooms at night. At Olympos you can live in a treehouse and go to see the burning mountain. Nemrut Dağı has a strange collections of stone heads on a remote mountaintop. There are many opportunities for mountain trekking throughout Turkey. Above is a U.S. government map of Turkey with some locations added. At right is a thumbnail of a larger U.S. government map showing physical features. Click on it for the full-sized version. 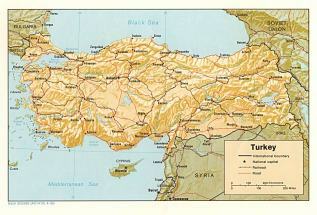 You can also find maps of Turkey at The University of Texas at Austin and supertravelnet.com. No guarantees that my Turkish language study guide will help you all that much, but maybe it will help. Antalya to Alexandria — US$ 110, no well-defined schedule. Izmir to Venice — US$ 150 for deck passage, more for a bunk, leaves Saturdays at 2100, takes three days to arrive. Oriental Rugs, Antique and Modern, by Walter A. Hawley, ISBN 0-486-22366-3. The Textile Museum in Washington, D.C. In central North America, I have reasonable success hearing Turkey on shortwave around my sunset and until midnight. TRT broadcasts on 9445, 9460, and 11885 kHz at 2200-0800 UTC, and on 7300 kHz 2300-0500 UTC (those transmissions start and end one hour earlier UTC in the summer).